This post was written on 2015-10-12 and revised, updated, and published on 2016-08-12. It’s sort of disjointed even though I already split it up into two separate posts, but I just wanted to be done with it, so I clicked publish. Drinking local beverages, whether that be coffee, tea, soda, beer, wine, or liquors, is an extension of the recently popularized “eat local” movement. To people just a few generations ago, this idea would have been common sense, but capitalism and some wars and insane advertising happened and for several decades Americans have had options limited by just a few major producers with limited offerings and mediocre quality. Many local producers had to close up shop because they couldn’t match the prices of mass producers or meet the crazy regulations placed on them by the government. The eating and drinking local movement has become popular again recently because, in my opinion, it is a way to support local artisans, businesses, and chefs. Supporting local shops has become a more normal thing to do and people have started to understand that it helps everyone involved and cycles money back into their own families and businesses, encourages diversity, strengthens the community, and is more sustainable (see this Time article or this Huffington Post article to learn more). People enjoy creating something unique and doing it for their own community and sharing it with their friends and neighbors. These products combine local ingredients, history, and names, are often higher quality than mass produced products, and are a reason to be proud of your local community. Local craft breweries have been opening up all over the area and it’s really exciting to me. Within 10-15 miles there are several establishments that I can drive to for a good meal with delicious food and fresh beer. I can bring home a growler or stay a few hours to see local original music. It’s one of my favorite things. There are also local distilleries and meaderies and wineries and cideries and coffee roasters that are passionate about what they produce and are eager to share what they do with anyone who is interested. Recently someone in my life asked what I was doing that weekend and I responded that I was attending a craft beer festival (Cheesetoberfest). That person then asked me what craft beer was. I did not know how to respond. It took me by surprise and it’s something that I thought every adult who isn’t living under an actual rock knows about. One of the hardest things that I have learned about becoming an adult is realizing that not everyone in my life has had the same privileges or experiences. It’s weird to say, but craft beer and purchasing/drinking local is something that I am excited about. Not everyone understands this or understands how to brew beer or taste beer, but everyone can enjoy beer. It just takes time to communicate with people who may have a completely different perception of what beer is. Once someone can understand that and taste a style of beer that they enjoy, I feel like they get it. There is more out there than just American adjunct light lager. The craft beer industry is complicated. I’ll eventually follow this up with a post about my thoughts on macro beer monopolies and craft beer ownership, but for now I’ll just say that you should know who makes the beer that you drink. Many local breweries make great beer, and we should be proud of that. Here is a map to show you where the closest brewery to your location in the USA. The first time that I tasted mead was a few years ago in Maine. Erin and I saw a bottle of Maine Mead Works HoneyMaker Blueberry mead on a shelf in the grocery store and decided to try it out since it was blueberry season and we were on vacation. I have been listening to a ton of homebrew and beer industry podcasts in the past year. One of the better meaderies mentioned occasionally is Moonlight Meadery. Mead is somewhat hard to find in local liquor stores, but State Line Liquors in Elkton, MD, has everything, so I went to their mead section and found a bottle from Moonlight Meadery that sounded good. “Wicked” is flavored with Madagascar-Bourbon vanilla and ginger. It was subtle and spicy and sweet and delicious. This year two meaderies are opening in Delaware – Liquid Alchemy Beverages in Wilmington, and Brimming Horn Meadery in Milton. I’m excited about both of these. Craft distilleries, meaderies, & cideries are the next wave of the craft beverage industry and are hopefully going to grow rapidly and expose people to the excellent diversity of delicious libations available to them. Mead has been on my list of things to try homebrewing for a while now. I have some ideas for flavors, now I just need to make the time to “brew” them. It isn’t as complicated a process as brewing beer, so I really should just do it. Tried a delicious flight of samples at our newest local meadery this past Saturday for National Mead Day. I loved the “Sweet Nothings” base mead and the “Thai Grrr” (chili peppers + lime) & we picked up a bottle of the “Choco-Cherry-Bon-Bon” (cherries + cacao nibs). Check out Liquid Alchemy Beverages near Newport/Elsmere Delaware if you get the chance. We also got to taste some of the new Twin Lakes (they moved to a new location) brews that same morning at a 5k fundraiser run. I’m not sure why beer is served after runs, but it happened. That night we were also able to join some friends and check out The Creamery of Kennett Square, a new beer garden. It’s dog friendly, which was so nice, and it had great music and lighting and decorating and seating and weather. Made for a wonderful evening. At the start of 2016 I started a new Instagram account called Badgerbrews. I have debated about whether or not to start a separate blog for beer and brewing related posts and I have decided for now to just keep all of my content in one place here on this site. I keep going back and forth about whether that is a good choice, but it is just easier for me to use a single site. I’ll put a link to this “Beer & Brewing” category in that Instagram profile link so that only the beer posts show up for visitors from that source. This is my journey through the world of fermented craft & homebrew beverages. Some of the content will be about commercial beers and breweries, some of it will be me homebrewing beverages, and other posts will be about other vineyards, distilleries, meaderies, cideries, and fermented beverages that I can find. I plan to expand on some of the stories and posts that I upload to Instagram here on this blog. Most likely I will use this as sort of a brew log with photos and recipes and processes and measurements from each batch which I will slowly upload over time. In 2015 I was trying to brew 100 gallons, for no specific reason other than that I thought that I could hit that threshold. I ended up brewing 21 batches (totalling 83.4 gallons) of beer that year, which taught me a ton about brewing processes, ingredients, & sanitization. Most of those batches were either for sharing with friends at Firefly music festival, for entering in the state fair homebrew competition (my Peach IPA won 2nd place in the Delaware ingredient category), and for our wedding, where we had 8 different homebrews + a homebrew cider + a homebrew wine. In 2016 I have not brewed as much, but when the summer heat starts to die down I’m sure I’ll start brewing more. I have a few new ideas for some fall and winter beers. As fall approaches, I wanted to brew a hard apple cider. It may or may not be ready in time for the wedding (19 days from today!! ), but it will at least be ready to drink as the weather gets colder and everything starts to become apple and pumpkin flavored (I brewed a pumpkin ale a few weeks back too). Over the past few years, I have noticed that there seem to be more ciders available. Strongbow and Angry Orchard have always been my top picks and they have both started to brew different varieties in addition to their regular apple cider. I like the taste of the honey and ginger and spiced cider styles, so I wanted to brew something that would combine all of those flavors. I started with researching other homebrew cider recipes that used fresh apples. Finding decent homebrew recipes, whether it’s for beer or cider, is not always an easy task. Everyone has different terminology and equipment setups and standards, so it I often have to find a few recipes that look good, combine them, and then modify it to be what I want. For this batch, I wanted to use fresh apple juice from our juicer. In the past, I’ve used fresh cider from the local orchard, but I wanted to do this all from scratch. I opted to use a juicer out of convenience (since we already own one) instead of building or borrowing a proper apple press that is traditionally used for making cider. I wasn’t sure on exactly how many apples to use. 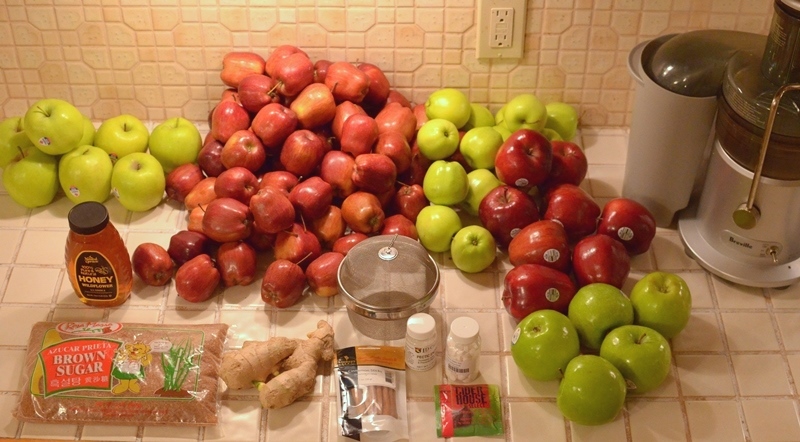 One estimate online said to use 25 pounds of apples for 5 gallons of cider. It seemed like that could be either way too much or way too little. That is what I ended up going with as a starting point though. I used a variety of red and green apples to blend the different tartness and sweetness levels. These were all purchased from my local farmer’s market, which is neither local nor a farmer’s market. It is cheap though. In total it was less than $20 for the apples. 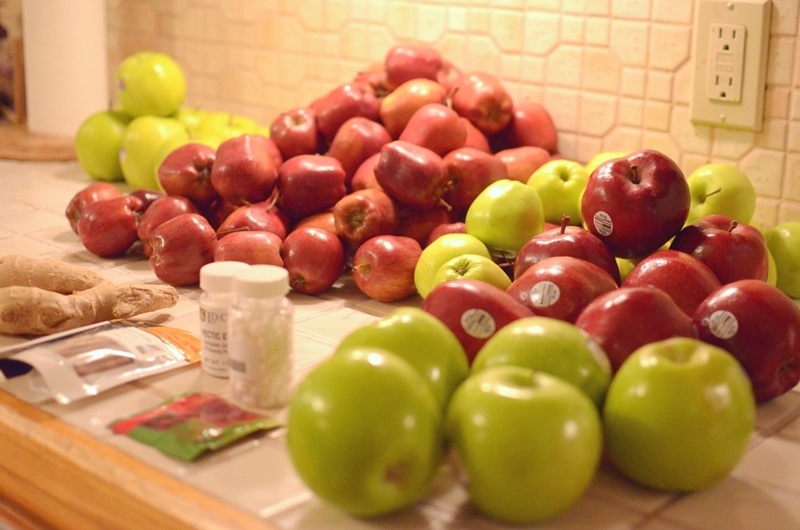 In the end I scrubbed, sliced, and juiced a little over 27 pounds of apples and got approximately 10 liters of juice (plus 4 lb 11 oz of dry pulp output that was used later to make dog treats). My juicer (a Breville) measures in metric, which I do not comprehend. Ten liters gave me a little over 2.5 gallons of juice to start with. I strained the juice using a mesh bag to get out the last bit of pulp. I took a specific gravity (sugar density) reading of 1.049. Then I added 3 ground up campden tablets (potassium metabisulfite) to the juice and started to heat it on the stove in my brewpot. The campden tablets in this case are helping to kill any bacteria or wild yeast strains. I was aiming to heat this up to around 185° F to kill off any microorganisms anyway, but the campden tablets make me feel a little bit safer. After I had the juice on the stove, I started to boil another half gallon of water in a separate pot. I added the two pounds of brown sugar and stirred to dissolve it. I then added that to the brewpot. I put three cinnamon sticks into a tea ball (that’s what I use for steeping ingredients), added a dash of allspice, poured in a pound of honey, and stirred everything up while it was heating. I added another gallon of water to bring down the sugar content and to increase the volume. I took another specific gravity measurement of 1.060 & 3.75 gallons. At this point it tasted extremely sweet even after adding water. I was fine with it having slightly lower final alcohol content (1.060 would finish ~8% ABV), so I added another gallon of water to bring it to a final 4.75 gallons and 1.053 gravity (~7% ABV). 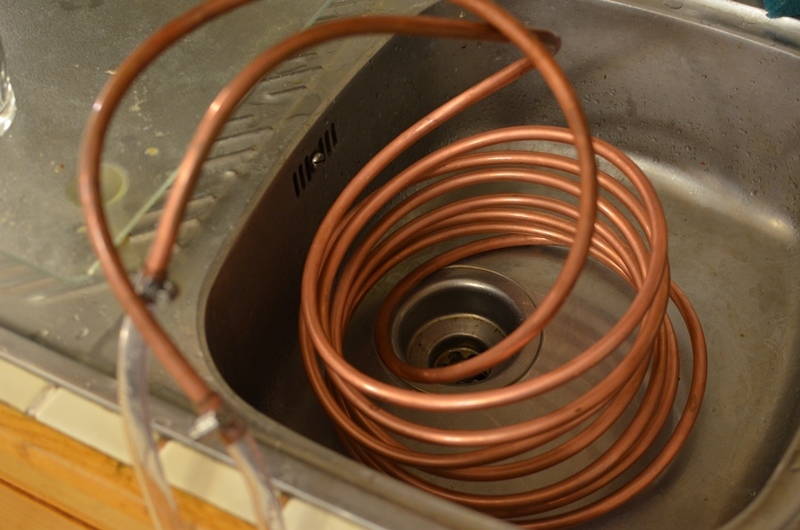 I heated the cider to 185° F, added 2 tsp pectic enzyme to reduce some haze in the final product, and then used my copper immersion chiller to chill it for 20 minutes down to ground water temp of ~80° F.
Copper immersion chiller, rinsed off after chilling. 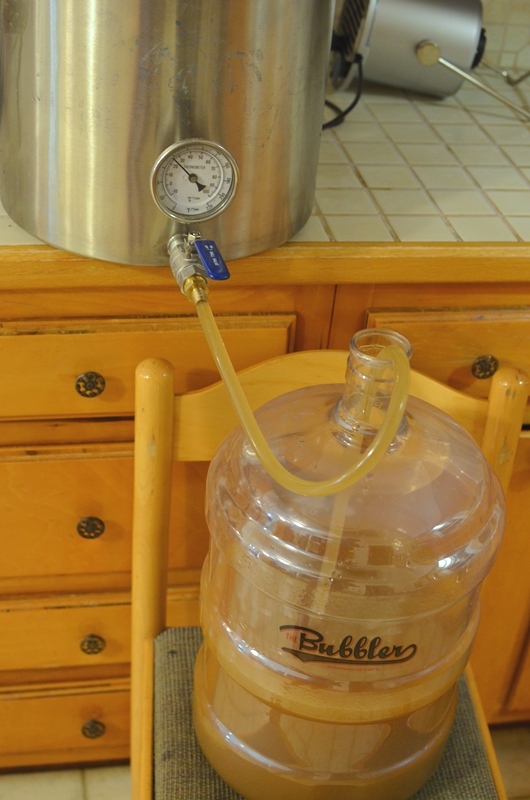 I transferred from the pot to a carboy and took a final reading (13 brix, 1.053). I left one of the cinnamon sticks in the carboy to add a little more flavor. I tasted the final sample and was really happy with the flavour and with the sweetness level. 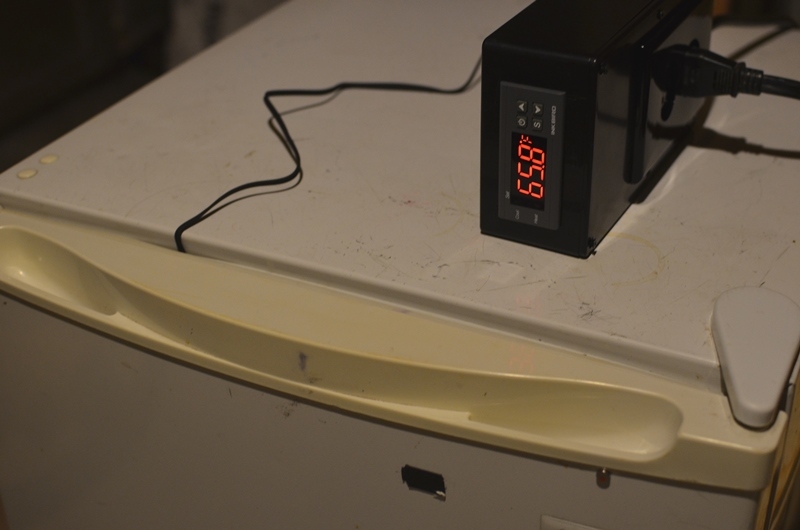 I pitched the Brewers Best cider yeast strain and then put the carboy in my temperature controlled fermentation fridge set for 65° F.
Transferring chilled must to carboy for fermentation. This was my 26th brew overall and my 2nd apple cider. Final measurements: 1.053 OG & 4.75 gallons. 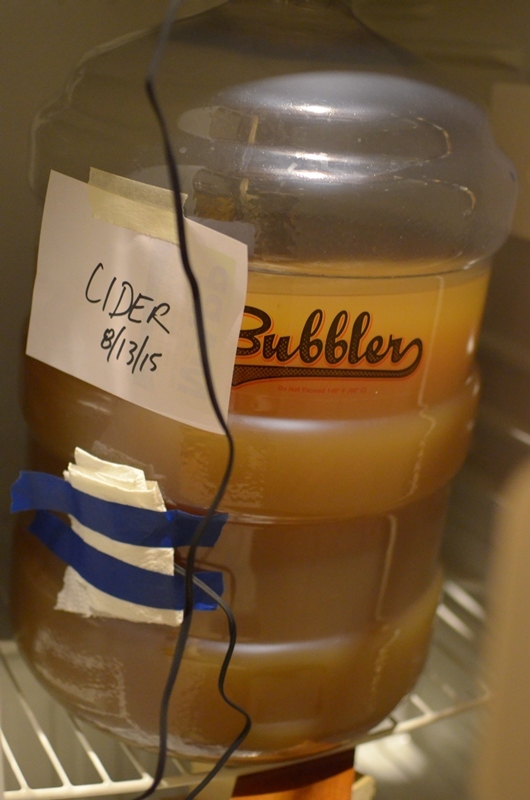 Cider before fermentation is called must (similar to how beer is called wort before fermentation). I thought of a lot of dumb puns using the word must but won’t post them because they are really lame. I hate recipes on Pinterest that have lots of text and pictures and leave the recipe near the bottom but have the instructions separate from the ingredients but now I’m realizing that that is just sort of a logical way to write a blog post that explains how you made something so now maybe I won’t be as angry when I read my next quinoa-cauliflower-sriracha vegan wings recipe. Also, this is a site I just found when making up that fake recipe idea: isitvegan.com. Anyway, now I just have to wait a couple of weeks and see how it turns out. Let me know if you actually read this or if you have any questions. Cheers! Brewed 2015-08-13. The individual apple weights don’t need to exactly match this and can be adjusted to your taste.